It appears that Digby’s cakes are typically dense and tough when made today. Many modern redactions significantly alter the original proportions of ingredients in an attempt to lighten the texture of these cookie-like cakes. Having read about kate flour, Jennifer was reminded of Digby’s instruction to dry the flour well by the fire before using, and confessed that she had never followed this step in the procedure. Could this be the missing link? It is easy to imagine that bakers were primed to pay specific attention to the level of moisture in the flour they were using. Did they discover that some recipes produced better results according to how well the flour had been dried? Looking through other recipes for cakes in Digby’s collection, it is noticeable that the only recipe requiring ‘flower well dryed by the fire’ is the recipe for ‘Excellent Small Cakes’. If he felt the need to include this instruction in a single recipe, he presumably considered it to be an important detail. You can probably guess what happened next. Yup – I have just made two batches of Digby cakes, one using kate flour (far) and the other using untreated flour (near). The dough made with kate flour was less easy to work with than that made with untreated flour. I flattened it with my hands and then rolled it to about 1/4 inch thickness. I used a round cookie cutter to cut circles and picked them up by squeezing the edges slightly as I lifted them. The untreated-flour dough was moister. It rolled out better and the circles were less fragile. I was able to transfer these more easily than the kate-flour circles to a lightly greased baking sheet. 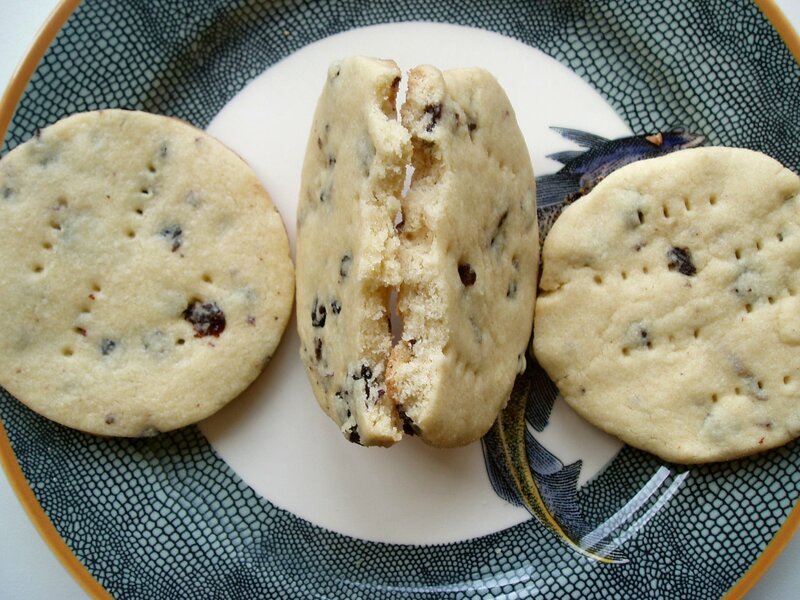 Although the untreated-flour dough certainly scored more points in terms of handling, the kate-flour ‘cakes’ (pictured on the right) won hands down when it came to taste and texture. They rose slightly higher than the untreated-flour cakes, had an open cake-like crumb and were meltingly delicious to eat. The untreated-flour cakes (pictured on the left) were dense, tough and chewy – hardly what I’d describe as either ‘excellent’ or ‘small cakes’. Preheat the oven to 190 degrees C. Lightly grease a large baking sheet. Combine the flour, sugar and currants in a large bowl and whisk to mix thoroughly. Cut the butter into small pieces and add to the flour mixture. Beat to combine. In a separate bowl, lightly combine the cream, egg yolk, nutmeg and wine. Stir into the flour/butter mixture to make a dough. Flatten the dough with your hands on a clean surface. Roll to a 1/4 inch thickness. 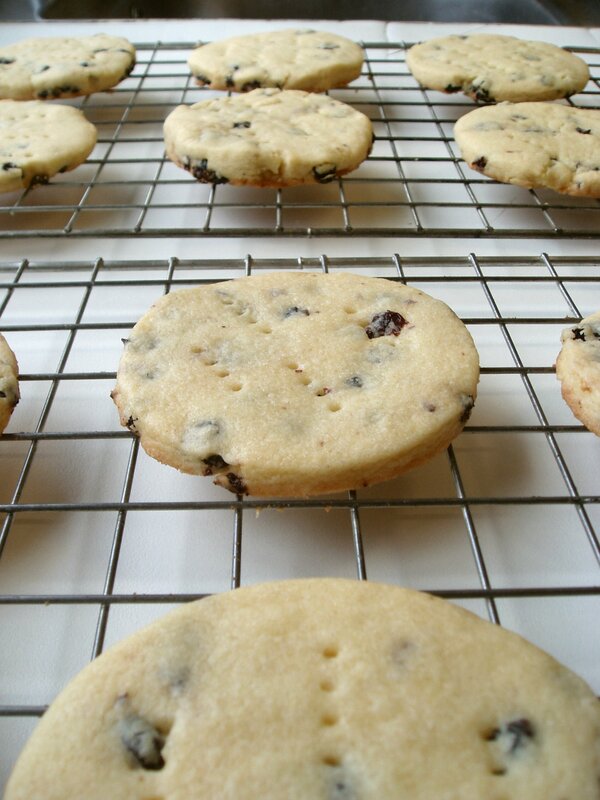 Cut into circles with a round cookie cutter and place on the baking sheet. Prick several times with a fork. Bake in the centre of the oven for 8 to 10 minutes. Leave to cool slightly on the baking sheet before transferring to a wire rack. When cool, the cakes may be iced with sugar. I didn’t ice my cakes, but I did find some references on sugar icing that provide recipe ideas from contemporary sources. this is wonderful info to add to the lecture i’m giving on flour this month! thanks and happy new year! p.s. i found an old recipe book–almost 100 years old–that states the importance of flour brand and recommends BEN HUR flour!!! Wow! That’s a fascinating result! I’m going to have to try them again myself, given I *adore* nutmeg and currants and had given the recipe up as not worth the effort. Thanks for commenting about how it turned out! Bravo! Another victory for Kate flour! I really think that you have started a revolution. Thank you again for publishing your findings, I just love reading them. Hi, I am a early modern European historian who made these earlier today with my class. I just wanted to put out there that we didn’t use kate flour (just unbleached all purpose organic), but they turned out lovely just the same. A nice sweet, buttery, spicy flavor that was a cross between a not-dry scone and a cookie. The class gobbled them up and they were so good I would make them tomorrow. So just a shout out to the recipe that we had real success making these little cakes. Thanks for reminding me about these cakes, Kelly – I must make them again sometime. I’m pleased you and your class enjoyed them too 🙂 .